Eshkol regional council head Gadi Yarkoni on Monday addressed reports that Hamas is ramping up its terror tunnel construction, and several attack tunnels have already crossed underneath the border. 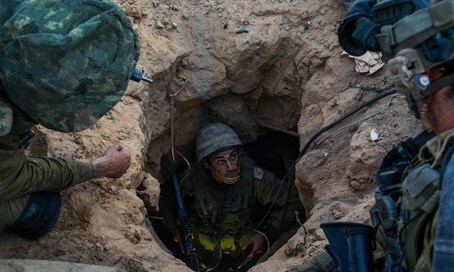 Yarkoni said that the IDF has checked the complaints of residents of the region adjacent to Gaza who said they heard the sounds of digging underneath their homes, and he claimed that the sounds were not from terror tunnels. "I don't say that there aren't tunnels, the IDF needs to say that there aren't tunnels. The IDF needs to check everything. The IDF should come to every resident who hears noises and give them an answer," Yarkoni told Army Radio. The regional head added that "up till today the IDF came and checked all the noises and didn't find that they were noises of tunnels." He did not say what the noises actually were caused by. "The IDF currently knows what it needs to do to prevent the tunnel threat - it must build the (tunnel) barrier. The Prime Minister knows what needs to be done - to approve building the barrier. That's the only answer. It will be easier to calm my residents when the Prime Minister and Defense Minister declare that there is nothing to prevent establishing the barrier against the tunnels." Yarkoni's statements come after Prime Minister Binyamin Netanyahu responded to sharp criticism from Opposition leader MK Yitzhak Herzog (Zionist Union) on Sunday. Herzog condemned the government inaction, saying, "what are they waiting for? For terrorists with weapons drawn to come into a kibbutz or moshav? The Prime Minister and Defense Minister owe the civilians an answer." Ironically Netanyahu's response later on Sunday essentially confirmed Herzog's criticism, as he vowed to act - only after Hamas attacked first. The Prime Minister said, "if we are attacked from the tunnels in the Gaza Strip we will act with very great strength against Hamas." Illustrating the intensity of Hamas's terror tunnel activity, just last Tuesday seven Hamas terrorists died in a tunnel collapse during the digging work. Recently the group has launched a propaganda campaign in Gaza touting its extensive tunnel digging activity.